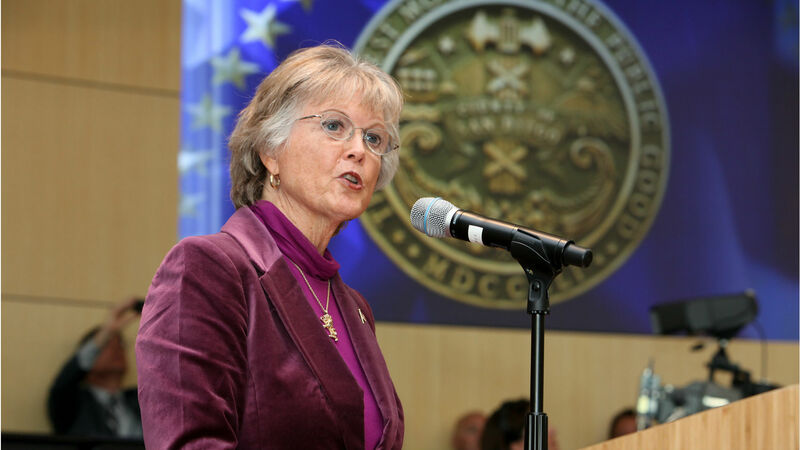 Not taking re-election for granted, East County Supervisor Dianne Jacob is seeking support for a seventh term in 2016. Photo courtesy of Supervisor Dianne Jacob. “Dianne will be seeking her final term on the Board of Supervisors next year, but because of term limits there are a number of termed-out politicians who could run against her,” said an email Friday signed by 16 community leaders. Among the signers of the “Dear Neighbor” note are former San Diego Zoo spokeswoman Joan Embery of Alpine and former La Mesa Councilman Ernie Ewin. In 2012, Jacob defeated 2003 Cedar Fire burn victim Rudy Reyes 77.6 percent to 22.1 percent to easily win a sixth term on the five-member county Board of Supervisors. She beat Reyes in 2008 by a similar margin. She was unopposed in 2004 and won a four-person race in 2000 with 61.5 percent of the vote. Jacob represents the 2nd District — largest in the county by geography. It includes El Cajon, La Mesa, Lemon Grove, Poway and Santee and unincorporated areas, with 620,000 residents.